The Church of St. Peter and St. Paul chancel is early 14th century in origin with a 15th century east window. The rest of the fabric seems to be mainly 15th century. . 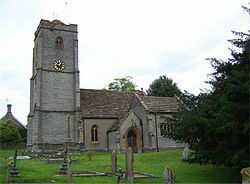 The church was restored in 1893, the material is the local lias stone with Ham stone dressings. Sunday Services are held rotating between Charlton Adam and Charlton Mackrell Churches. The first Sunday is 9.30am Holy Communion, Second Sunday 9.30 am Healing Service, Third Sunday is 9,30am Holy Communion and the Fourth Sunday The All Age Service is held in the Reading Room in Charlton Mackrell we regularly have a "Benefice Together Holy Communion" around the churches in the Benefice.On the second Tuesday of the month we meet for Worship and Praise in the Reading Room, Charlton Mackrell. There are of course additional services in the churches of the Benefice on Sundays. Details of services can be found on the website and also on the Benefice Magazine "Contact" available in church or on this website. We also provide services for Weddings, Funerals and Baptisms.